In Japan, every tourist attraction and nearly every city has their own mascot. Mascots are very popular in Japan as a way to bring more people into an area or even a shop or restaurant. There are mascots to represent Tokyo Tower and Tokyo Sky Tree. There are mascots to help sell products at shops such as Don Quijote. When visiting Osaka, I had a chance to see some of the famous and even not so famous mascots. The most infamous mascot has to be the kuidaore. Kuidaore Taro is a drummer boy like mascot that was originally the mascot of a restaurant by the same name but is now considered the main mascot of Osaka. There are other figures in Osaka that are nearly as important, such as Billiken Man. Billiken Man represents Osaka very well in his motto, “The god of things as they ought to be”. It is a pretty laid back motto which really fits for Osaka. There are so many mascots and most of them can easily be seen in Dotonbori, but it can be difficult to find a lot of information about them. 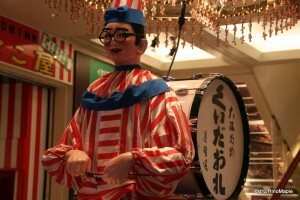 Kuidaore Taro, first name Taro, is a life sized doll of a young teenager in a clown costume playing a drum and symbol. It is a very creepy looking doll that has been in Osaka since 1950. He was originally brought to the Cui-daore restaurant as a gimmick to bring more customers into the shop. Kuidaore is a Japanese expression to say that you are eating too much. The nuance of the expression kuidaore is a little complex as it also includes gluttony and eating just for the sake of eating something. It is a little fitting for for me in Osaka as I would just eat until I was nearly dead as I wanted to eat everything possible. Over the years, Kuidaore’s popularity never waned but the restaurant’s popularity did. In 2008, the restaurant folded and the CEO of Cui-daore decided to take a vacation with Kuidaore. The CEO took Kuidaore on a trip throughout Japan that lasted nearly a year before Kuidaore was put back to work. Cui-daore as a restaurant has folded, but Cui-daore as a management company was born. Today, wherever you go in Osaka, you are bound to see Kuidaore. He is now on display in Dotonbori just a block or so away from the original restaurant. The original restaurant is still standing but it has been shuttered and awaits its future. Kuidaore is just as creepy today as he was in the past. He continues to play his drum and symbol every day and still has hundreds of people taking his picture or getting their pictures taken with him. He is a huge icon of Osaka and regardless of him being a little creepy, people still love him nonetheless. If scary or creepy clowns are not interesting, Osaka is also famous for Billiken, a god that was created by an American. Billiken is a charm doll that was created by Florence Pretz in St. Louis around 1908. It was brought to Japan in 1908 and placed in the original Tsutenkaku Tower. Other Billiken dolls were also created and placed in a few shrines in the Kansai region as well and they can still be seen to this day. During WWII, the original Tsutenkaku Tower, modeled after the Eiffel Tower, was severely damaged due to a fire and subsequently dismantled. 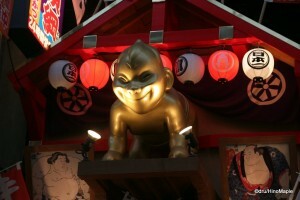 During the dismantling of Tsutenkaku, the original Billiken was lost. The tower was rebuilt after the war and around 1980, a new Billiken statue was placed in the tower. Billiken dolls and statues can be found throughout the area surrounding Tsutenkaku. Billiken is the defining symbol of the area around Tsutenkaku. 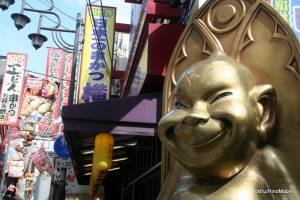 Billiken is the god of “things as they ought to be” which is quite fitting for Osaka. The quote has a very laissez faire feel to it and many people in Osaka are very laid back in their attitudes. Billiken is also a god of good fortune for those who have him. He brings even better luck if he is given to you rather than you having to buy him. The combination of his laissez fair godliness as well as brining good fortune makes him the best mascot of Osaka. Glico is one of the most famous confectionery companies in the world. They are primarily known for Pocky, the biscuit like sticks coated in chocolate. In Japan, Glico is not only known for Pocky, but also for their caramel products; Pretz, a savoury version of Pocky; and Bisko, a popular cookie for kids. Before coming to Japan, I didn’t know what Glico was, but I was always familiar with Pocky. They are delicious and a lot of fun to eat. Glico in Japan conjures up various thoughts and images from Japanese people, but there is one image that represents, not just the company, but Osaka as well. The main mascot of Glico is the Glico Man. 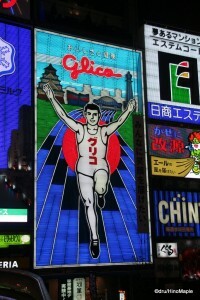 Glico Man is a 300 metre race runner who is running down a blue track with his hands in the air. A 300 metre race is a very strange number, but there is a serious reason Glico chose 300 metres. Glico originally started as a caramel candy company, and after doing some math using an average male, a 300 metre run burns the same amount of calories as eating one piece of Glico caramel. It is a little strange to hear, but whoever designed this character thought a lot about the backstory. In Osaka, a trip to Dotonbori would not be complete without a visit to Ebisubashi and a photo of Glico Man. Glico Man has been adorning the side of a building next to Ebisubashi for nearly a century. The Glico Man has been upgraded from time to time but the basic image has remained the same. He is running with his hands up on a neon blue track with a few Osakan landmarks in the background. I heard that they change the sign a little to commemorate various achievements within the city itself. The light show from the billboard is a lot of fun to watch and you can spend a lot of time just watching the show. It is probably one of the most well-known pictures in Japan and anyone who sees it will recognize it and photograph it. While Glico Man may not be the most popular mascot in Osaka, he is probably one of the most recognizable mascots of Osaka in the world. Kuidaore, Billiken, and the Glico Man are the most famous mascots in Osaka. They are not the only mascots as many of the other shops also have their own mascots. Walking in Dotonbori is a great way to see the various mascots that are in Osaka. A crab restaurant called Kanidoraku is one famous restaurant that has its own “mascot” on the outside of their buildings. They have a large crab where the legs and claws move. It is very cheesy but a lot of fun to watch. Unfortunately, they are probably trying to conserve power in Japan so the last time I was there, the legs and claws were not moving at all. There is also Kushikatsu Daruma. 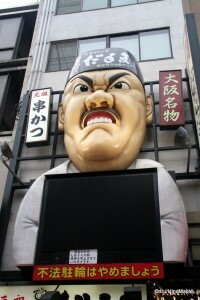 It is a kushikatsu restaurant whose mascot is an angry looking Asian chef with a fu manchu. It is strange to see but you can see it in many places around Osaka. Next up is Kinryuu Ramen, which has a large dragon eating a bowl of ramen. It is a somewhat large chain of ramen shops, but the ramen never looked very good to be honest. Kinryuu is a combination of the words “gold” and “dragon”, so it can easily be translated to be “Golden Dragon”. Next up is Bikuri Donkey, which, as you can guess, has a donkey as its mascot. This mascot is not very well known as I only saw it at their Dotonbori branch and never anywhere else. Probably the most famous mascot is the Donpen of Don Quijote. Don Quijote actually has two mascots, one of the god Ebisu, and one of Donpen. Donpen is their official mascot and can be found at all of their stores and in all of their advertisements. It is pretty cute but Donpen isn’t actually from Kansai as the store is headquartered in Tokyo. 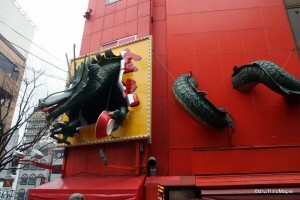 However, the Dotonbori branch of Don Quijote is a major symbol of the area and Osaka as well. As you can see, there are lots of mascots everywhere in Osaka. There are many ways to see the mascots of Osaka. One of the best ways to see them is to take a stroll through Dotonbori which will also bring you to a place that is full of life at night. People are walking everywhere and you can see all of Osaka’s mascots in one place. Many shops capitalize on the popularity of their mascots and you can find various souvenirs within Dotonbori that sell items related to the various mascots. Some are monetized better than others such as Kuidaore. You can find various miniature sized replicas of various mascots; candy that looks like various mascots; and an array of small toys that fit onto cell phones. It can sometimes be a bit overwhelming and difficult to choose just one if you love all of the mascots, but it is a lot of fun to see everything. The mascots may not mean much to most foreigners at first but they do grow on you very quickly. This entry was posted in Kansai and tagged Bikuri Donkey, Biliken, Biliken Man, Billiken, Billiken Man, Cui-daore, Cui-daore Taro, Cuidaore, Don Quijote, Donki, Donpen, Eiffel Tower, Florence Pretz, Glico, Glico Man, japan, Kanidoraku, kansai, Kinryu, Kinryu Ramen, Kinryuu, Kinryuu Ramen, Kui-daore, Kui-daore Taro, Kuidaore, Kuidaore Taro, Kushikatsu Daruma, Mascot, osaka, Osaka's Mascot, Osaka-fu, Osaka-shi, PockyBisko, Pretz, things as they ought to be, Tsutenkaku, Tsutenkaku Tower by Dru. Bookmark the permalink. You’ve just made me realize that Tokyo doesn’t have a city or prefecture mascot. (Does it?) Its services do (police, fire brigade, etc). Its wards do. Its landmarks (Sky Tree!) do. The city itself? I took a look myself and I never found an actual mascot. Maybe we can make one with a Yurikamome. It is the bird of Tokyo. Then again, I think the Yurikamome is a sports mascot in Tokyo. Just a general sports mascot.